Global Mining Industry Outlook - What Are the Expectations? 2018 Mining Industry Outlook - What Are The Expectations? 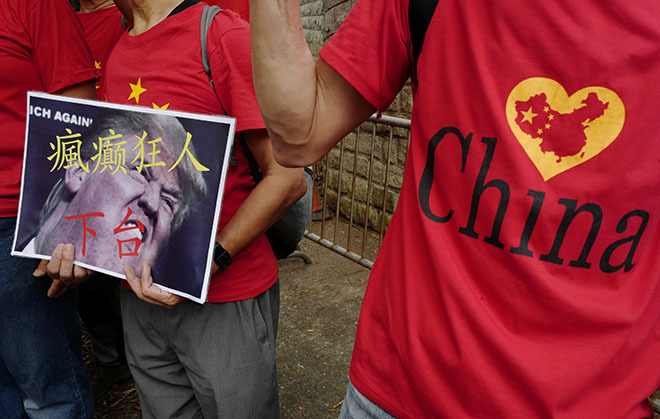 Pro-China demonstrators display a placard with the Chinese words meaning "Crazy man step down" while protesting President Donald Trump's trade policies Oct. 1 outside the U.S. consulate in Hong Kong. This is part one of a two-part series on critical minerals. This installment looks at the United States' reliance on other countries for materials that are scarcely mined domestically, while part two examines possible solutions. Where other eras of human civilization may have been primarily defined by one element — think the Bronze Age or the Copper Age — today's technology-driven economy depends on a delicate balance of global trade of nearly all of the elements on the periodic table. Because those elements are not found in abundance everywhere and are obtainable more cheaply in some places than others, rising trade tensions between an import-dependent U.S. and its global trading partners pose a potential threat to national security and supply chains throughout the U.S. economy. The U.S. is highly reliant on other countries for materials not mined domestically, many of which are vital to technology, defense, construction and other sectors. The U.S. relied on other countries for more than half of its consumption of 50 nonfuel mineral commodities in 2017, the U.S. Department of the Interior's U.S. Geological Survey reported in a 2018 publication. The country relied 100% on imports for 21 of those minerals. This reliance on other countries has the attention of the Pentagon, which is reportedly preparing a report that says the nation is vulnerable because of its dependence on imported minerals. 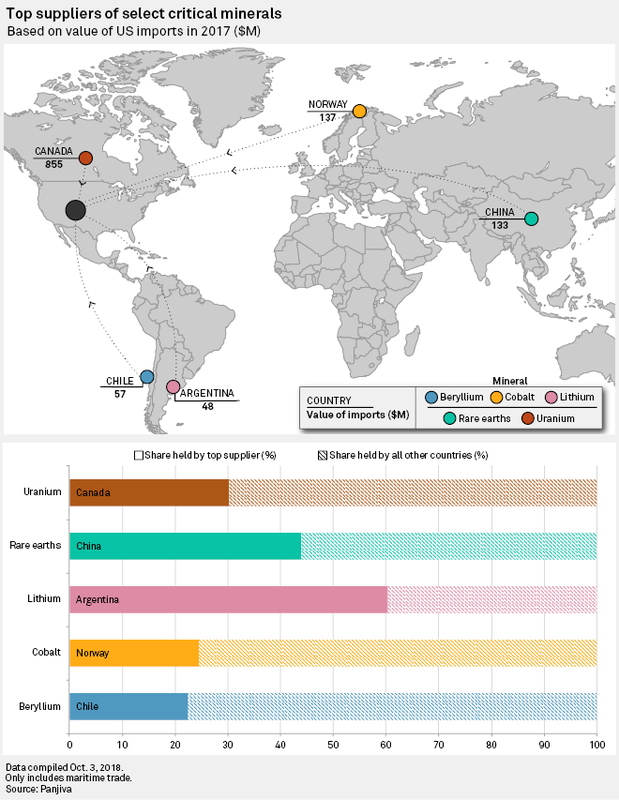 U.S. reliance on other countries for critical minerals has increased over the past several decades: In 1978, the U.S. relied 100% on imports for just seven mineral commodities and was only 50% reliant on about 25 mineral commodities, according to the National Mining Association. Net importation of a material may not necessarily be a bad thing, particularly if it provides cheaper manufacturing inputs for higher-value products, but it can present a problem if geopolitical conflicts interrupt a supply chain with limited alternatives. Since taking office, President Donald Trump and his administration have made aggressive moves, at times aggravating important trading partners, including top exporters of critical materials such as Canada and China. While recent trade spats between the U.S. and Canada and Mexico have shown signs of cooling off, dealings with several countries holding the power to limit U.S. access to important materials, including China, remain tense. China has continued to respond to U.S. trade actions with rapid-fire escalation of tariffs of its own. In its recently revised list of $200 billion in tariffs, the U.S. hinted at challenges the country faces in limiting goods from one of its top trading partners when it spared rare earth minerals — a material in which China dominates global production. "It seems to me a pretty obvious threat or lever that other countries could use," said William Shughart, an economics professor at Utah State University and research director at the Independent Institute, a nonpartisan think tank. "If you want to put us over a barrel, [China] could do so very easily by threatening to withhold shipments of the stuff we're buying from them." The path leading to America's reliance on other countries for mined materials has been complicated and systemic, said Joe Balash, assistant secretary for land and minerals management at the Interior Department. He pins the blame on decades of policies reducing the availability of public lands. The Trump administration is reviewing public land use plans, but Balash said that will only address some of the country's import-reliance problems as a fast-moving economy outpaces slow-moving shifts in policy. "There are some commodities on the list that have only become important in the last few years," Balash said. "The speed with which technology is moving makes a very slow and deliberate process (land use planning, mineral exploration, and mine plan permitting) seem out of step with what the economy demands." While manufacturing and mining became progressively more expensive in the U.S with an increase in regulations and wages over the past few decades, companies from places like China wedged themselves into the supply chains of critical minerals that would later become invaluable economic building blocks. "The Middle East has its oil, China has rare earth," Deng Xiaoping, a prominent Chinese politician, reportedly said in the early 1990s. "It's a misunderstood technical, financial and policy matter by the United States," said Corby Anderson, a professor at the Colorado School of Mines. Chinese industry can hold prices of vital commodities lower, he said, thanks to a combination of abundant capacity and state backing. "Making money is important," he said. "But maintaining market share can be equally important, even if you lose money, to drive your competition out." Meanwhile, U.S. policy can be a drag on development. "While the U.S. is rich in mineral resources, we lack the common-sense policy required to make best use of them," Ashley Burke, a spokeswoman for the National Mining Association, told S&P Global Market Intelligence. The economic implications, Burke stressed, are real. She said that in 1993, the U.S. attracted 20% of global mining exploration dollars, a figure that eroded to just 7% as Canada and Australia continue to attract more mining investment. One of the greatest obstacles, Burke said, is much longer permitting times that can stretch out over a decade instead of two to three years in places like Canada or Australia. "The longer the wait, the more the value of the investment is eroded, even to the extent that the project ultimately becomes an unviable investment," Burke said. "Even a large high-grade deposit will remain unmined if the balance between costs, revenue and timetable [is] unfavorable." In March 2017 testimony to the U.S. Congress, Rio Tinto Aluminium Ltd. CEO Alf Barrios said a recent USGS finding that the U.S. was highly import reliant for nearly "half of the naturally occurring elements on the periodic table" should set off alarm bells in the White House and Congress. "This drift away from greater self-sufficiency for the basic building blocks of our economy compromises our economic and national security and ignores North America's rich reserves of metals and minerals that are the front end of the manufacturing supply chain," Barrios told the U.S. Senate Committee on Energy and Natural Resources. Those building blocks are used across the economic spectrum. For example, in 2017 the U.S. imported about 92% of the potash used in agricultural fertilizer products, primarily from Canada, Russia, Chile and Israel. While the administration is supporting research seeking ways to extract rare earths from coal, a commodity the U.S. exports in abundance, the U.S. remains 100% reliant on imports of rare earth materials, vital feedstocks for the technology sector. "Rare earths make supercomputers work. They make drones fly. They're involved in health services," Jim McKenzie, president and CEO of rare earths explorer Ucore Rare Metals Inc., said in an interview. "You find them right across the technological spectrum, and without them you basically are going to be dead in the water in terms of competing internationally in the technology arena." As an example, about 47% of imported beryllium consumed in the U.S. in 2017 came from Kazakhstan, and there is essentially no sustainable source of the mineral outside the U.S., said John McCloskey, vice president of global communications for Ohio-based Materion Corp., which operates the nation's only beryllium mine in Utah. Other countries have explored options for the commercial mining of beryllium, but volumes are not near sufficient for global demand. "When it comes to national security, the implications of this can be troubling," McCloskey said of a shift toward U.S. import reliance. "In terms of specialty materials with relatively small markets, it is not hard to see how a nation-state can disrupt or distort the global market relatively easily. Reliance on a small number of overseas suppliers can then become risky very quickly, either because of affirmatively bad actions by a foreign actor or due to inadvertent changes in global availability or supply routes." Beryllium is a critical mineral used in consumer electronics, industrial components, automotive electronics, defense applications, telecommunications infrastructure, energy applications and medical applications. Without the material's unique properties, many military, industrial and consumer electronic systems would either not work or be much larger and heavier, McCloskey said. The U.S. saw about 200 tonnes of apparent consumption of the material in 2017, with about 49 tonnes of the material being imported in the period. 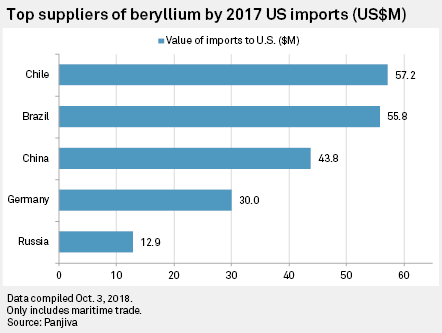 While the U.S. is not as reliant on imports for beryllium as it is for other materials, a slow permitting process at home and few options elsewhere is a similar story told across the spectrum of critical minerals essential to most areas of the U.S. economy. Recognizing a potential national security threat, the Pentagon is reportedly preparing a report that concludes the U.S. is too dependent on vital materials. Officials familiar with the forthcoming report have said it will recommend a guaranteed profit for those mining niche materials critical to developing U.S. weaponry, Foreign Policy recently reported. Greg Gregory, president of Matrion subsidiary Materion Natural Resources, told S&P Global Market Intelligence that the country needs a "whole-of-government approach" across department and agency lines to ensure the security of supply of critical minerals and address concerns about mining on public lands and long permitting delays. "First, mining is a heavily regulated industry, and rightfully so. Our facility is regulated by over half a dozen state and federal agencies," Gregory said. "However, some federal agencies with little expertise in mining seek to promulgate new regulations that do nothing to increase safety or improve the environment, but only serve to increase the cost of mining in the United States and make it difficult to compete with foreign competitors, even in countries such as Canada and Australia."